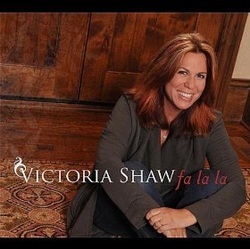 Victoria Shaw is one of the greatest songwriters anywhere, not just Nashville. So it's not surprising to see that she contributes on all eight of the original songs on her special Christmas album, and she produced it. She has two bonus tracks one is "Fa La La (reggae version)" and the other is a delightful rendition of the classic 1958 Chipmunks song, "Christmas Don't Be Late". This special version has her accompanied by her two daughters. The two bonus tracks clearly demonstrate Shaw's sense of humor. I mean, after all, who doesn't like the Chipmunks. The standout track on the album is the beautifully sung "Virgin's Lullaby" which features the always handsome Ty Herdon, Jimmy Wayne, Chad Carlson and Billy Dean. The fourth song on the cd, "Pink Flamingo's", was a sure hit for my grandsons. As soon as they heard "Set out some cookies and beer / and junior asked will Santa find us here," since they have just moved here to Florida from up north, they wanted to know if Santa would find them here? Her beautiful voice and words have been heard on some of the greatest hits of the past two decades. She has penned songs, and collaborated with some of country's best known artists, including one of my all-time favorite country singers, Garth Brooks. I definitely got into the holiday spirit a little early this year. While listening to this festive cd I managed to hang the lights, decorate my tree, and even decked the halls. Shaw's newsletter says, "This is truly a Christmas cd for the whole family that you will want to play year after year" and I couldn't agree more.